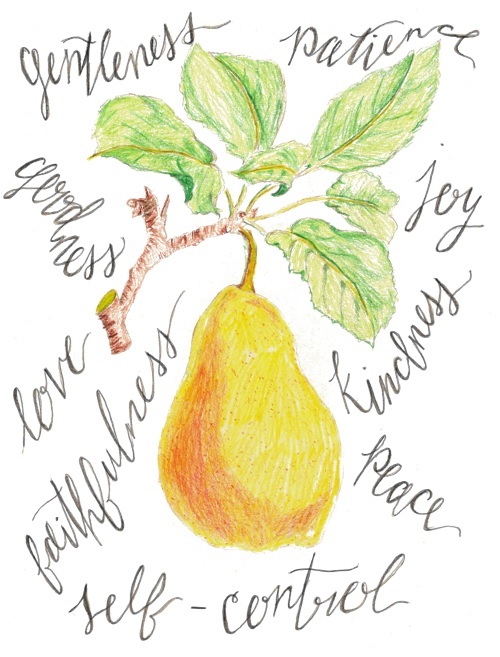 Based on Galatians 5:22-23, this year's theme, chosen by Moderator Debbie Humphrey, is "The Fruit of the Spirit." The conference logo was drawn by Betsy St. John, niece of the moderator and a member of the Roanoke, Ninth Street Church of the Brethren. The moderator's article can be found here! All-Conference Registration, Hospitality & Exhibits: 5:00 p.m. – 6:50 p.m.
Hymn Singing and Worship: 7:00 p.m.; Preacher: Donita Keister, Moderator of the 2019 Annual Conference; Childcare provided. Youth leave for Camp Bethel – 8:30 p.m.
Young Adult Ice Cream Social – 8:30 p.m. Registration, Hospitality & Exhibits: Opens at 7:30 a.m.; Also during lunch and breaks. Business Sessions: 9:10 a.m. - 12:00 noon & 1:20 p.m. - 4:00 p.m.
Click here to download and print the delegate registration form and other information. Please send a check made payable to Virlina District and the completed registration form to the Virlina District Resource Center. Registration for delegates closes on September 28th! Delegates will need to check in during registration times on the Friday or Saturday of conference. This will be located in the foyer of the Community Life Center. Delegates will receive their delegate packet at check-in. Please note that the registration form for delegates does not automatically register one for meals. Booklets will be mailed to congregations in October. Pastors or contact persons are asked to distribute the booklets to the delegates. Delegates should bring their booklets to conference. The 2017 District Conference Minutes will be published in the 2018 District Conference Booklet. We will order books this year based on how many delegates register by the deadline. A number of booklets will be reserved for non-delegates and office holders. Parts of the booklet will also be available on here once those pages are finalized. Click here for the Age Group Activities Flyer and Form! Click here for the Age Group Activities Form only! Childcare will be available for infants and toddlers during Worship and Business Sessions: Friday (November 9) 6:45 - 8:30 p.m.; Saturday (November 10) 8:00 a.m. - 12:10 noon and 1:10 - 4:10 p.m. (or when business ends). Please fill out the registration form and deliver or mail to the District Resource Center by October 26th. The activities for children are Saturday, November 10, 8:00 a.m. - 4:10 p.m. (or when business ends). Activities will include a Bible lesson, crafts, recreation, music, snack and an off-site trip to Camp Bethel for lunch and hiking. Children will need to wear suitable clothing for outdoor play. Booster/car seats will need to be left with the leaders. A more detailed schedule will be available online and onsite. The cost is $7.00 Please fill out the registration form and deliver or mail with payment to the District Resource Center by October 26th. Junior and Senior High Youth are invited to attend an overnight trip to Camp Bethel following worship on Friday night (7 p.m.). Vans will transport youth and advisors to Camp Bethel at 8:30 p.m. from Bonsack Baptist. Participants will play games, do low ropes, go on a hike, and help rake leaves. Breakfast and lunch are included. Please bring appropriate clothes, shoes, gloves, a sleeping bag, toiletries, any other over-night belongings, a rake, and snacks to share if you wish. Vans will leave Camp Bethel at 2:30 p.m. on Saturday to return to Bonsack Baptist by 3:00 p.m. Youth who cannot make it to Bonsack Baptist by 8:30 p.m. on Friday can be checked-in at Camp at the Deerfield Gym Conference Room anytime after 9:00 p.m. The cost is $20.00 per youth. Please fill out the registration form and deliver or mail with payment to the District Resource Center by October 26th. Join other young adults from around the district Friday evening following worship for an ice cream social. Registration for non-delegates will also take place in the foyer of the Community Life Center during the scheduled registration times. Non-delegates do not have to pre-register unless it’s for the children’s and youth activities. The Hospitality Area will be located in the café area outside the Roanoke Hall, and will be open while exhibits are open. MINISTERS AND SPOUSES DINNER – Reservation required! The Ministers and Spouses Dinner will be held on Friday, November 9 in the Roanoke Hall at Bonsack Baptist. Registration will begin at 4:30 p.m. and dinner will be served at 5:00 p.m. The cost will be $15.00 per person. Free childcare will be provided for all ages during the dinner and program. Chanticleer Catering of Roanoke will cater the dinner. Following dinner, Jeff Carter, President of Bethany Theological Seminary, will have the program. Reserve yours by October 26th. CLICK HERE FOR THE FORM. LUNCH ON SATURDAY – Reservation required! There will be a buffet lunch of sandwiches (turkey, baked ham, buffalo chicken, chicken salad, vegetarian wrap – or gluten free turkey and cheese roll-ups), mixed greens salad, pasta salad, cabbage slaw, mixed fruit, cookies, chips and beverages (lemonade and water). The lunch is catered by Chanticleer Catering and the cost is $10.00 per person. Reservations forms have been sent to congregations by mail or email. Meal tickets will be distributed on Friday evening and Saturday morning at the meal ticket table in the registration area. The deadline for lunch reservations is October 26th. CLICK HERE FOR THE FORM. There will be no choir this year. Instead, there will be a praise band during the Friday evening worship service. All items must be packed inside of the cloth bag. To purchase an affordable bag, visit: https://www.myshopangel.com/product-p/sbqlhb50cws.htm. This bag is designed especially for these kits, and cost about $1.69 each. Or, download the school bag pattern and make your own: http://cwskits.org/assemble-kits/school-kits/. Please assemble the bags and bring them in a box or larger container to district conference. We ask that you also provide the processing fee per kit. Congregations can write a check made payable to Church World Service and bring that with the bags in a sealed envelope. Or, processing fees can be paid online at the CWS page. We will take care of delivering the kits. Financial contributions can also be donated to Brethren Disaster Ministries for trips and situations that routinely pop up. Congregations or individuals wishing to donate money can send checks made payable to the Virlina District (“BDM” in the memo line) and we will send one check to them after district conference. CLICK HERE FOR THE SERVICE PROJECT FLYER. From I-81, take Exit 150-A. Stay on Route 220 Alternate / Cloverdale Road for five miles. Bonsack Baptist is on the left. From Route 460, take Route 220 Alternate / Cloverdale Road and the church will be on the right before the next stop light. If traveling west on 460 from Bedford/Lynchburg, this will be a right turn. If traveling east on 460 from Roanoke, this will be a left turn. Bonsack Baptist has plenty of parking in front of the Sanctuary and the Community Life Center (to the left of the Sanctuary). All spaces are accessible from the first or second Cloverdale Road entrance. Parking volunteers will be present to greet and direct you to the right place. 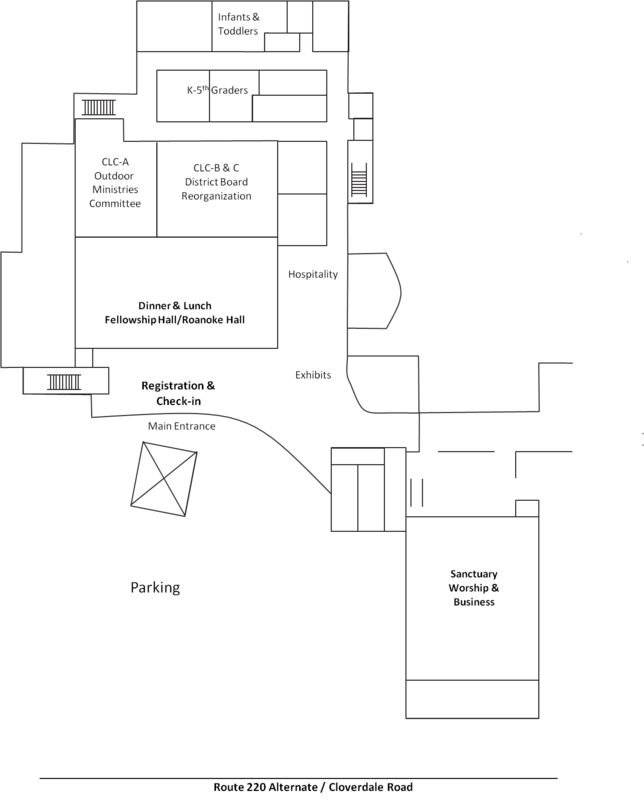 The below map shows the Community Life Center and Sanctuary, where all of our conference meetings and meals will be held. 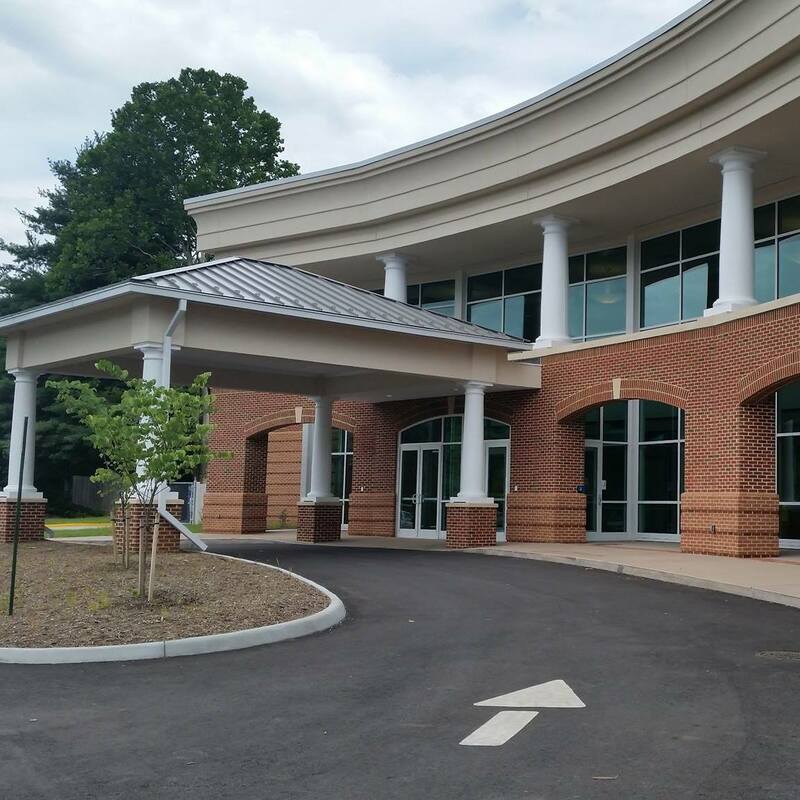 The following picture is the exterior of the main entrance to the Community Life Center. This is where registration and check-in will be. Please use this entrance! Contact the District Resource Center with questions. To view previous District Conference pages, click here.